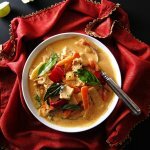 Instant Pot Thai Grilled Chicken (Gai Yang) is a pressure cooker adaptation of the popular Thai street food. The recipe uses chicken thighs, which are meaty and perfect for cooking in the Instant Pot, because they stay moist. 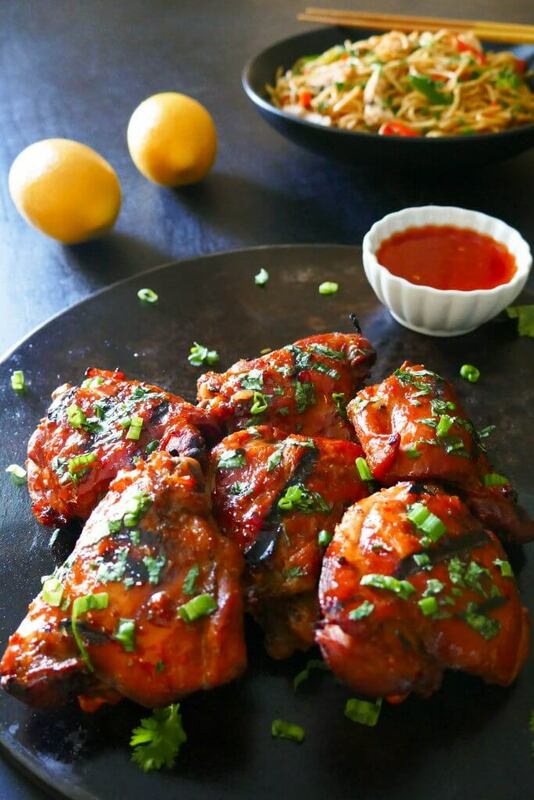 Finishing on the grill and glazing with Thai sweet chili sauce gives the chicken a spicy-sweet barbecue flavor that’s irresistible! Like most folks who live through snowy and cold winters, we love spending as much time outdoors as we can in the summertime! And that means we love eating outdoors and grilling. 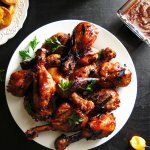 I especially love to grill bone-in chicken thighs! I’ve found that the Instant Pot is a great time saver because it allows me to precook meat with the marinade ahead of time, and then when I’m ready, I just need to put the cooked meat on the barbecue grill for a few minutes to get that grilled look and flavor. If you love Thai food like I do, you may be familiar with Gai Yang which is a Thai barbecue chicken that’s common in Thailand as a street food. Whether you’ve had it before or not, I think you’re going to love this recipe. It’s really flavorful. As usual, I adapted my regular Thai Grilled Chicken recipe and had to go through a few revisions before settling on this Instant Pot version. The flavors of all the different sauces and ingredients come together to create a flavor bomb! Here’s the thing about this recipe, though. It may require a trip to an Asian store unless you have a very well-stocked local grocery store. And of course, you can always find the ingredients at amazon. Normally, I tell you in my recipes that marination is optional if you’re short on time, and I’ll say that again here, but for this recipe I recommend you marinate the chicken. You’re really going to notice a difference when you marinate the chicken for even a few hours. 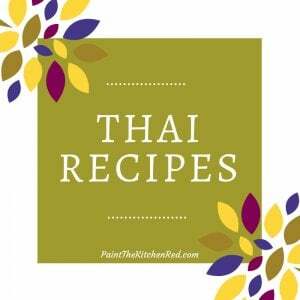 As a timesaver, I often do the pressure cook step for this Instant Pot Thai Grilled Chicken recipe, and then refrigerate the chicken. I remove the chicken from the fridge before I need to grill it. This works great if I want to prepare this for company. If you want to make this recipe in the winter time, or you don’t have access to a grill, it’s fine to place the chicken thighs in the oven 4 inches from the top and broil the chicken until there are few charred brown spots, turning once. Basting the chicken after it’s barbecued is an important step because the Thai sweet chili sauce acts as a glaze and adds amazing flavor. The one ingredient you might not be familiar with is sweet dark soy sauce that’s sometimes known as black soy sauce. Black soy sauce is a special Thai soy sauce. It’s dark, thick, sweet and has the consistency of molasses. My favorite brand is Healthy Boy but any Thai brand will do. If you can’t find it, you can substitute kecap manis, which is a very similar Indonesian soy sauce and may be more readily available. 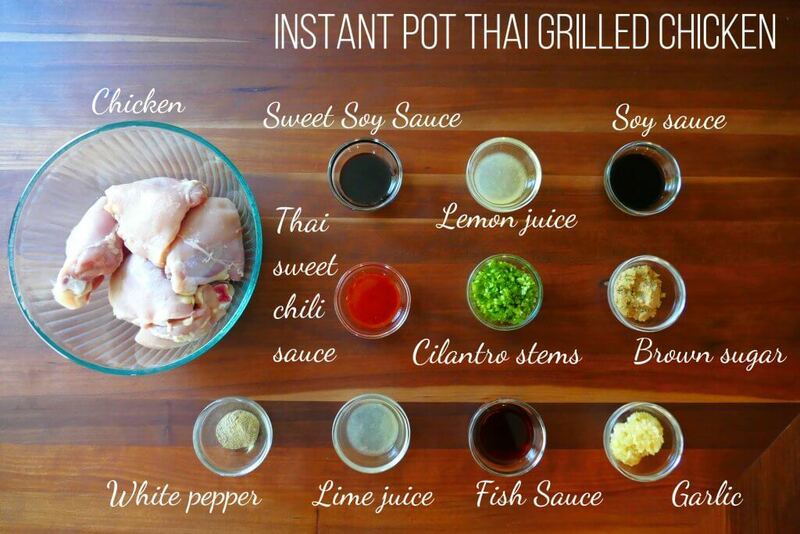 If you’re new to the Instant Pot and aren’t familiar with how to use it, please read the Instant Pot DUO Beginner’s Quick Start Guide or the Instant Pot ULTRA Beginner’s Quick Start Guide first and then come back here to learn how to make this Instant Pot Thai Grilled Chicken. Whisk together soy sauce, sweet dark soy sauce, fish sauce, lemon juice, lime juice, white pepper, brown sugar, garlic, and cilantro stems in a medium bowl. Add mixture to chicken thighs in a large bowl. Marinate for at least 30 minutes, preferably 4 hours to overnight. Transfer chicken and marinade to Instant Pot inner pot. Press ‘Manual’ (or ‘Pressure Cook’) and ‘+’ or ‘-‘ until the display reads ‘9′ (9 minutes). Select Pressure Cook mode and adjust the time to 9 minutes (00:09). The display will count down from 9 to 0; it will then switch to ‘Keep Warm’ mode and display ‘L0:00’ or ’00 00′ and begin to count up. Transfer chicken from Instant Pot to a large bowl with tongs or large spoon. Empty cooking liquid into the same bowl. Let the chicken thighs sit in the juices while you prepare your grill. Preheat grill approximately 350 degrees Fahrenheit. Grill chicken for just enough time to get sear marks on both sides, and to give it a grilled look and flavor, about 4 to 5 minutes per side. 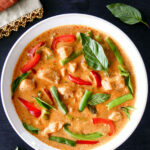 Transfer grilled chicken to a serving dish and immediately baste both sides with Thai sweet chili sauce. Sprinkle with green onions and chopped cilantro. Instant Pot Thai Grilled Chicken (Gai Yang) is a pressure cooker adaptation of the popular Thai street food. The recipe uses chicken thighs, which are meaty and perfect for cooking in the Instant Pot, because they stay moist. Finishing on the grill gives the chicken a barbecue flavor that’s irresistible! 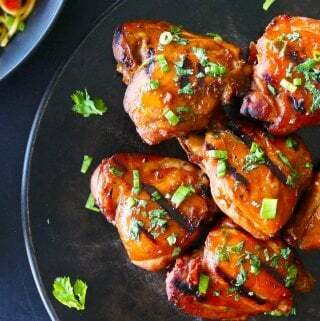 For the marinade, whisk together soy sauce, sweet dark soy sauce, fish sauce, lemon juice, lime juice, white pepper, brown sugar, garlic, and cilantro stems in a medium bowl. Place chicken thighs in a large bowl and pour in the marinade. Marinate for at least 30 minutes, preferably 4 hours to overnight. Pressure cook for 9 minutes. Do a quick release of pressure (QR). Preheat grill to approximately 350 degrees Fahrenheit. Prep time does not include steps that are already accounted for in the ingredient list, e.g. minced garlic, cut vegetables, etc.. If you're not planning on grilling or broiling the chicken, you can increase the pressure cooking time by a couple of minutes, and do a Natural Pressure Release (NPR). I finally got around to making this last night. Another winner. Even though I accidentally burned the chicken skin on the grill, it still tasted great. The Thai Chicken thighs were fantastic!. I live in the LA area so no problem getting all the ingredients in local stores. One comment: 350 is not “high”, at least not on my natural gas grill. High is more like 650. 350 is medium or even “medium low”. 350 is the right temp, the chicken is already cooked and is just getting spiffed up on the gril. Hi Bob, thanks for the comment! You’re right, I will remove the reference to ‘high’ and just leave the temperature. Thank you!